Manila, Philippines - State weather bureau PAGASA released severe weather bulletin update as of 11a.m. on Saturday, July 19, 2014. PAGASA said that 'Bagyong Henry' with international name of Matmo continues to move over the Philippine Sea as it intensifies. At 10:00 AM today, the center of Typhoon “Henry” was estimated based on all available data at 560 km East of Guiuan, Eastern Samar (11.0°N, 131.2°E). 'Henry', the eight typhoon to enter the country this year and the third for the month of July has a maximum sustained winds of 95kph near the center and gustiness of up to 120kph. It is forecast to move Northwest at 19 kph. Tropical Storm “Henry” is expected to be at 470 km East of Virac, Cantanduanes by tomorrow morning (July 20) and at 410 km East of Tuguegarao Cagayan by Monday morning (July 21). By Tuesday morning (July 22), it is expected to be at 120 km East of Basco, Batanes. The estimated rainfall amount is from 7.5 – 15 mm per hour (moderate - heavy) within the 400 km diameter of the Tropical Storm. 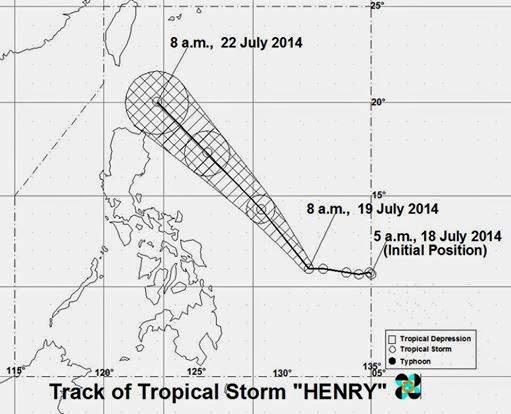 "Henry” will not yet affect any part of the country. However, fisherfolks and those with small seacrafts are advised not to venture into the eastern seaboard of Visayas and Mindanao. It is expected to enhance Southwest monsoon and may bring moderate to ocassionally heavy rainshowers and thunderstorms over Visayas and Mindanao especially on the western section.